Caroline XI had a “simple, yet elegant design” (Eric Engebretsen, a guest engineer from Rolls-Royce at Cyber Blue’s 2009 Critical Design Review). After debating several chassis designs, we decided to use the provided frame and create a four-wheel wide style chassis for FIRST’s 2009 game, Lunacy. It was driven by two CIM motors, each geared through an AndyMark GEM500 Planetary Gearbox. The lift was a dual conveyor, which means that one set of conveyor material off-set eight inches from the other. These two rollers were set at an approximate sixty-degree angle, with a hopper at the top portion of the robot large enough to hold between fifteen and twenty orbit balls. The door opened by two, ten-inch pneumatic cylinders when our “powered dumper” (mentor Kevin Kelly) came within range of our target. Caroline XI was a straightforward, effective approach to Lunacy. One of the strengths that stood out with Caroline XI is that all the systems were incorporated together into one cohesive unit. For example, our drive system incorporated two transmissions direct driven to the back two rover wheels. These wheels were then connected to the front two rover wheels by means of #25 chain. Another example was the effective lift system which picked the moon rocks off the floor. By having two rollers, one in front, one behind, we could lift multiple moon rocks very, very quickly. 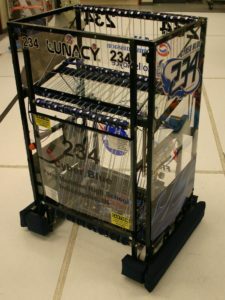 It also gave us the unique capability to have one half the system fail and our robot still be able to compete effectively; namely, being able to score on its own. The team undertook a project two years ago to make our autonomous mode the most competitive and adaptable in FIRST. After a lot of hard work and long nights, we were able to create the Autonomous Code Generator (ACG). Instead of a few selections on a switch for autonomous that allow altering our strategy on the field, we had an extra spot on the switch; a selection that could be picked that has a custom made code. This gave us the option to generate a specific code that could be used to disrupt, help, or avoid the other robots. Another key feature was our ability to do everything quickly: drive, pickup, dump, fix… All aspects of our robot were quick.